Summary: Jasmine and Chelsea have always been encouraged to advocate for social justice, but when the clubs they are a part of don’t allow them to advocate for themselves and what they believe to be right, they start their own club: a blog called Write Like a Girl that allows them to speak out about the issues they face. 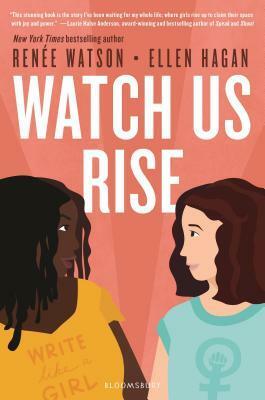 When the club begins to make waves and the adults in their school become uncomfortable, Chelsea and Jasmine have to dig deep to discover their purpose and take bigger steps to stand up for what they believe is right. Most Appropriate For: Jasmine and Chelsea are both juniors in high school. They are dealing with normal issues for this age. That being said, there is no reason that I would be worried about giving this book to sixth grade students (11-12 year olds). The only hesitation I have would be that the poetry is often abstract and may be difficult for younger readers to understand. At one point during this book, I found myself thinking “man, being friends with these girls would be exhausting.” And then I immediately thought “woah, check your privilege.” And that is what I like most about this book. It is about checking your friends, your classmates, your teachers, your parents. It is about pointing out how simple, everyday actions need to change to make the world accepting and to move us toward equality. It is a reminder that marginalized groups do not get to put down that weight. Not ever. This book wasn’t perfect. There were times when I found the narrative and characters a little bit clunky. But those preferences in writing style are overridden by the book’s importance. Jasmine and Chelsea are two normal teenage girls: they are navigating loss, and friendship, and family, and crushes. While they’re doing this, as if trying to be a teenager isn’t challenging enough, they are also learning how to be activists and speak out for a world they know they deserve to live in. They are learning how to stand up for what they believe is right in ways that are purposeful and intentional and we get to learn with them. This book should become an essential for everyone. Get it into the hands of the kids with a fire burning to help guide them, get it into the hands that don’t seem to be on fire quite yet to place the kindling. There are about several ways that I can see this book being used in the classroom, but none of them are rooted entirely in skills. It could be used as a starting point for a unit on social justice. It could be used to talk about activism. I can imagine discussions with students on the actions that Chelsea and Jasmine took that they think went well, and the actions they think could have been done with more intention. It could be used to help students see what issue nags at them the most, as this book does an excellent job of mentioning nearly all social justice issues at one point or another. Excerpts of chapters could work as examples of what Chelsea and Jasmine experience and how those experiences turn into blog posts or poems. Before having students turn their own experiences into blog posts or poems. The moral of the story is that this book begs to be used with students.